Passive House buildings are energy efficient buildings that provide users with high levels of comfort and excellent air quality around the clock. 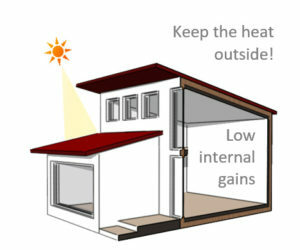 In order to help building users make the most out of their Passive House buildings, the Passive House Institute’s training and development team has come up with a few simple tips and tricks for residents of Passive House buildings. The airtight layer usually lies on the interior surface of exterior walls (membrane, plaster). It is best to puncture it as little as possible. Instead, you could find ways of hanging pictures without nails. If you do have to puncture the walls, be sure to carefully close any remaining holes once fasteners have been removed. Just like with a vacuum cleaner, you should replace the G4, M5 and F8 filters of the filter box and the G3 filters at the extract air valves (if using) once a year. This will ensure the ventilation unit is clean and effectively maintaining indoor air quality. You should also help fresh air circulate through the building by keeping overflow air openings in doors and extract/supply valves clear. – Extract air volume ≈ supply air volume. Let an expert check the balance for you! – Further reduce your energy consumption by opening your windows for ventilation when outside temperatures and humidity levels are close to the desired indoor climate – Don’t forget to turn the ventilation unit on again as outdoor conditions change. – If you find the air too dry during cold spells in winter, reduce air flow. You may supplement this by hanging the laundry inside and keeping indoor plants. – To make your life easier, keep all initial valve settings and positions or ask a qualified expert before making any changes. 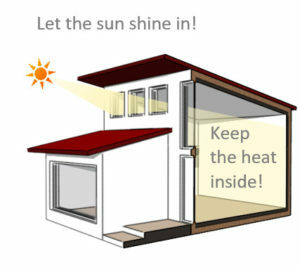 Allow sunshine to heat your space for free by ensuring exterior shading is open during cold periods. Reading a computer screen becomes more comfortable with an interior glare screen in place. When interior temperatures increase beyond your comfort level, just use the shading. In Passive House buildings, night-time setback systems (automatic systems that lower room temperatures at night to save on heating costs) are hardly effective and thus an unnecessary complication. You only need a little heating power, which can be supplied without interruption or radiators below your windows! There are no peak load problems in Passive House buildings: Thanks to their high inertia, the cooling demand is small and almost constant. Use the exterior shading diligently though! This information is also available as a PDF to share with your colleagues and tenants! Learn more about the Passive House concept with the Passive House Institute’s e-learning courses. e-learning, energy efficiency, passive house, residents, tips, tricks. Bookmark.